Welcome to Panther Pep Bands! The UNI School of Music boasts two exciting Pep Bands that perform for basketball games during the fall and spring semesters. These ensembles are an important generator of spirit at men's and women's home basketball games. Select members of this ensemble travel to post season conference and NCAA tournaments. Membership in the Pep Bands is open to all UNI students. Student musicians representing virtually every academic discipline perform a varied and highly energized musical repertoire. A limited number of Pep Band scholarships are awarded each season by audition. Basketball Pep Band auditions are held in late September. The UNI Basketball Pep Bands are spring semester classes that meet from November to March. Audition information and Schedules are below. 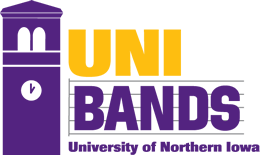 Attend the Mandatory Pep Band Meeting on Monday, October 1, 2018 at 8:40 p.m. in the UNI-Dome Stands. All information about band assignments and scholarship auditions will be discussed at this meeting. Please bring your yearly planner to this meeting so that we can discuss tournament dates. Students who would like to be eligible for a scholarship must audition for a scholarship position. After the auditions you will be assigned to either the Purple or Gold Pep Band, and a schedule of performances for the band you are assigned will be emailed to you. Students who would like to join the band without a scholarship may be asked to play individually in order to facilitate the assignment of parts. More information about this will be discussed at the mandatory meeting. Please refer to documentation provided at the meeting for all specific details. For wind and bass auditions, please prepare a short piece (a pep band song is acceptable) and the UNI Fight Song (PDFs are located Here). There will be a short sight reading portion. For drumset, you will be asked to perform the UNI Fight Song on drumset, and during the audition you will also be asked to create a drum part to accompany a recording. The recording is located here. After the auditions you will be assigned to either the Purple or Gold Pep Band, and a schedule of performances for the band you are assigned will be emailed to you. There will be 2 Rehearsals in October for Basketball Pep Band. Please refer to the information provided at the meeting for the schedule. Students who wish to be considered for a Leadership position in the Pep Band should fill out an online application form, available here. QUESTIONS about joining the Basketball Bands? Email Graduate Assistant Chris Copeland at copelanc@uni.edu.